A leading engineering company in Scotland's energy industry is understood to be on the verge of calling in administrators. 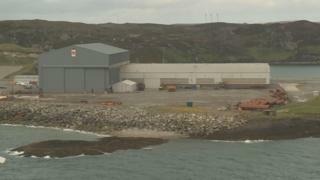 BiFab, or Burntisland Fabricators, has two yards in Fife and one at Arnish on the Isle of Lewis. The firm builds large-scale equipment for the offshore oil and gas industry, as well as platforms for offshore wind turbines and tidal generators. There are currently more than 600 people working at the yards. The BBC understands BiFab has had cash flow problems linked to a contract for the Beatrice offshore wind farm in the Moray Firth, and has filed court papers with an intention to go into administration. A year ago BiFab secured a £100m contract for the manufacture of 26 offshore wind turbine jackets from the Dutch contractor Seaway Heavy Lifting (SHL), part of the £2.6bn Beatrice Offshore Windfarm Ltd (Bowl project in the Outer Moray Firth led by energy giant SSE. The company is thought to be in discussions with the Scottish government's economic development agency. The GMB union, which has 440 members across the three yards, said it had not been consulted and would hold an emergency workplace meeting with members in Fife on Monday morning. GMB Scotland Secretary Gary Smith said: "This would be a hammer blow for BiFab's workers and their communities in Fife and the Isle of Lewis, as well as the wider Scottish economy. "It goes without saying that our members demand urgent answers from the employer about how it has ended up in this position less than a year after securing such a significant contract. "We are in contact with the Scottish government and the possibility of losing over 600 highly skilled and decent paid jobs doesn't bear thinking about. "Letting these workers and their communities go under is not an option." BiFab has been a success story and one of the best hopes in Scotland for creating jobs linked to the second wind for oil, gas and offshore renewable energy. Set up in 2001 by the late John Robertson, it put new life into the activities of the 1970s and 1980s, when fabrication of giant North Sea platforms kept construction yards busy. From Burntisland, it expanded to the massive Methil yard and took on the Arnish yard on Lewis, both of which have seen boom and bust. The industry's order books remain cyclical, but by merging offshore oil and gas with renewables, it seemed a good approach to help even out the workflow. The boom years earlier this decade for west of Shetland oil and gas fields saw Methil kept busy. With those projects coming to an end, BiFab could look to the platforms required for offshore wind arrays in the Moray Firth and off the Fife coast. The latter, called Neart na Gaoithe, was given the green light by a Supreme Court judgement in the past week, ruling against a challenge on wildlife grounds. However, the 22,000-tonne, £100m deal to build 26 of the 84 jackets for the Beatrice project in the Moray Firth, for final delivery by next April, appears to be the source of the financial difficulties. BiFab is sub-contracted to Seaway Heavy Lifting, which in turn is building the project for a consortium led by Perth-based energy firm SSE, with quarter of its funding from China. Unite Scotland leader Pat Rafferty said he would be contacting the Scottish government to seek assurances about the jobs at stake. He said: "Let's not mince words here - the Scottish government cannot stand by and watch BiFab being turned into an industrial graveyard. "Make no mistake, Unite and its sister unions will not let that happen." Lesley Laird, Labour MP for Kirkcaldy and Cowdenbeath, said: "This is very sad and disappointing news. "BiFab is a key strategic player in Scotland's renewable energy sector and has built up an enviable reputation for carrying out this type of work. "Moreover, BiFab is a significant employer, having provided work for thousands of highly skilled workers at its yards in Burntisland and Methil for nearly two decades. "The timing of this development is particularly cruel given that the Inch Cape, Neart na Gaoithe, Seagreen Alpha and Bravo projects were only this month given a final green-light, thereby ensuring a massive future market on BiFab's doorstep." She said the Scottish government "must step in" and come up with a rescue package as well as providing support which helps develop a longer term strategy for the company and the industry." Scottish Labour's economy spokeswoman Jackie Baillie said: "This is devastating news for Fife and the wider Scottish economy. "This announcement has left hundreds of skilled jobs at stake and the Scottish government must take immediate action to try and save BiFab and keep these jobs in Scotland. "The only priority now is to save jobs, skills and yards from closure."